While the stock market is off doing its own thing (rising, mostly) the real story is playing out in the bond market, which saw its work week in a year last week. What does it all mean? Obviously there’s no agreement. Over at FiveThirtyEight.com an argument that the bond selloff is basically a positive sign — investors are increasing their risk appetite, mostly. 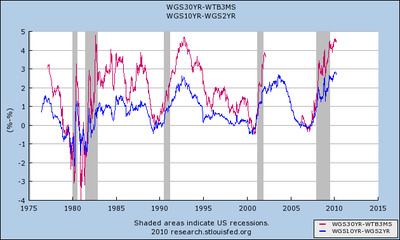 Steve Randy Waldman at Interfluidity also has a thorough analysis, and notes the following chart, which shows that two different yield spreads 2Y/10Y and 3M/30Y are both right near historical all-time highs, but, haven’t yet quite broken beyond historical ranges. And over at Asia Timese, David P. Goldman ponders the connection between the bond selloff the bizarrely low savings rate, and the deficit. If the 10-year Treasury yield pops up by 100 to 200 basis points or so, households will shift out of consumption into savings. If half of the deficit were to be financed by a rise in savings, the savings rate would jump to 10%, that is, by six percentage points, and consumption would fall by 6 percentage points of GDP. So much for the recovery. The Fed will keep the game going as long as it can, but it seems unlikely that investors will play along indefinitely. Last one out of the Treasury market is a rotten egg. Added: James Hamilton of EconBrowser also weighs in and is worth your read. 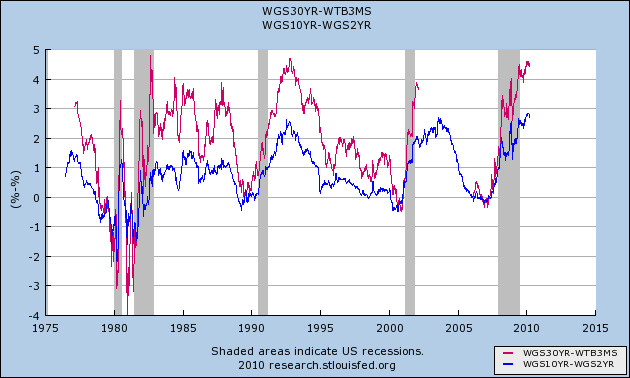 His point, basically is that rising bond yields combined with rising equities is usually a sign of optimism.